Last night I was invited to attend a book club which meets in the oldest continuously-inhabited house in Dorset. We gathered in the old hall, with three beautiful 13th century lancet windows overlooking the croquet lawn. It was our host’s great-grandmother, I think, who had that part of the moat filled in for croquet. How civilised! We drank Venetian wine and nibbled on baklava, and people talked about the Yashim books, politely. Something that emerged from the talk was the glaring demand for a map to accompany the books, and maybe a cast-list for people who get lost among the unfamiliar names. Let me know what you think. 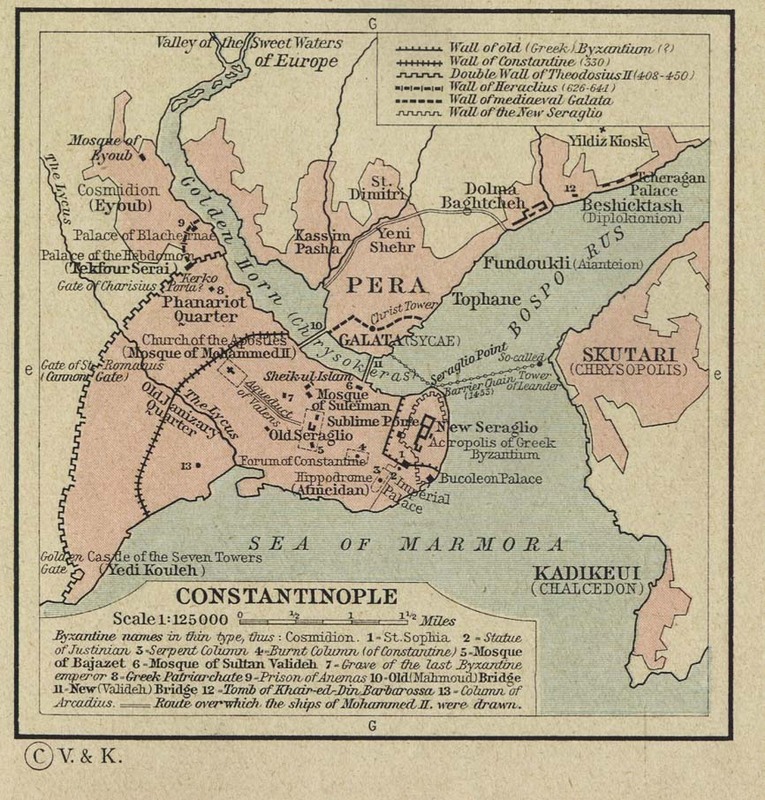 Here is a pretty clear map of Istanbul/Constantinople, showing some of the major landmarks. You can see the Phanariot Quarter – modern-day Fener – incorporating Balat, where Yashim lives. Pera, across the Golden Horn, was the ‘European’ quarter’, and Ambassador Palewski’s Residence stands a little inland from Tophane, among the foreign embassies. The Galata Tower, one of the fire-fighter’s watch points in The Janissary Tree, is here labelled Christ Tower, and Topkapi palace, home of the sultans and their harems, is called the New Seraglio. The church of Hagia Sophia is just outside its walls. The Hippodrome, or Atmeidan, is the site of the Serpent Column in The Snake Stone. Of the two bridges shown across the Golden Horn, only the more easterly Galata bridge existed in Yashim’s time: its construction features in An Evil Eye. This entry was posted on March 21, 2012 by admin. That sounds a wonderfully civilised evening – and yes, a map is handy. The one you have chosen is charming. maybe gazing at the leonardo picture, Lady with Ermine? When I look at maps or reading I am always anticipating to find something that according to my motherland did not exist..
That reminds me of visiting Romania in 1990, and trying to buy a decent map of the country. The only map we could find was a coloured shape of Romania showing, I think, the position of Bucharest. The names of countries which lay across the borders – Hungary, Bulgaria, USSR etc – were simply left blank. Crisis averted: what to do on the plane! Kathleen Jordan on Yashim Cooks Istanbul Storms US Charts!